Dr. Rajiv Parakh is a popular General Surgeon in NH8, Gurgaon, Delhi. He has over 36 years of experience as a General Surgeon. He has completed FRCS from Royal College of Surgeons, United Kingdom in 1987, M.B.B.S. from Maulana Azad Medical College, Delhi in 1982, MS (Surgery) from Maulana Azad Medical College, Delhi in 1986. He is being honoured by Sushil Malik Oration - Indian Medical Association - SDB Prof. Hari Vaishnava Oration By Delhi Medical Association, Sushil Malik Oration by Indian Medical Association, SDB Organizing Chairman 13th Annual Conference of Vascular Society of India attended by the President and Treasurer of the Vascular Society of Great Britain, and the Editor of the European Journal of Vascular Surgery Prof. Hari Vaishnava Oration By Delhi Medical Association Organizing Chairman 13th Annual Conference of Vascular Society of India attended by the President and Treasurer of the Vascular Society of Great Britain, and the Editor of the European Journal of Vascular Surgery. 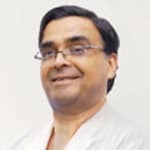 The doctor has a professional membership of Elected Vice President of International Society for Vascular Surgery (USA), Elected Secretary of International Society for Vascular Surgery (ISVS), USA Founder & Life Member of Vascular Society of India (VSI) You can consult Dr. Rajiv Parakh at Medanta-The Medicity in NH8, Gurgaon, Delhi. You can book an instant appointment online with Dr. Rajiv Parakh on Lybrate.com. Find numerous General Surgeons in India from the comfort of your home on Lybrate.com. You will find General Surgeons with more than 41 years of experience on Lybrate.com. You can find General Surgeons online in Delhi and from across India. View the profile of medical specialists and their reviews from other patients to make an informed decision. Dr. Rajiv Parakh is a popular General Surgeon in NH8, Gurgaon, Delhi. He has over 37 years of experience as a General Surgeon. He has completed FRCS, M.B.B.S., MS (Surgery) . You can consult Dr. Rajiv Parakh at Medanta-The Medicity in NH8, Gurgaon, Delhi. You can book an instant appointment online with Dr. Rajiv Parakh on Lybrate.com. Find numerous General Surgeons in India from the comfort of your home on Lybrate.com. You will find General Surgeons with more than 33 years of experience on Lybrate.com. You can find General Surgeons online in Delhi and from across India. View the profile of medical specialists and their reviews from other patients to make an informed decision. I was using panderm plus and now I can see the side effects after using it actually I got very dark patches on my skin n immediately I want to remove it please help me for that sir. Hello. Panderm plus contains steroids and must not be used without a doctor's prescription and if used has to be for short duration as steroid have lots of side effects and damage skin. Now a Plain Sunscreen till the effect of steroid are reversed. You can add a depigmenting creams after. Consulting a Dermatologist. Myself Subhash Choudhary. Male - 29. I have acne / pimples marks on face. Dark & oily skin. Please suggest medicine & cream. PLease suggest a fairness cream also. I am 47 years old female. I have become very weak. Moreover I have developed hyperpigmentation and a lot of wrinkles. I am worried what it could be or it a sign of something harmful. Please guide me. Hello, the pigmentation are of two types superficial and deep. The superficial pigmentation respond to creams. The deeper ones need chemical peels and lasers and additional depigmentation creams. You can start initially on milder depigmentation creams which contain kojic acid, arbutin, niacinamide like Melaglow at night and use sunscreen (SPF 35 and above) three times a day. There is options of glutathione injections to oral tablets with vitamin C, also laser toning also gives good results. Laser toning using Q switch Nd Yag laser is an option but results variable. You may need 6-8 sessions at 3 weeks gap. And depending on type of skin whether oily or dry you can choose a face wash. It need examination and personalised plan. You can consult in private with photographs. There are some white heads on my face, I don't know what to do. And pls tell me what are the causes behind this ? The eruption of pimples, black marks and oily skin and face are due to excessive sebum secreted by sebaceous glands and hair follicles especially on the face.. Precautions- * Don't scratch or pinch your pimples This will cause more damage and scars. . * Avoid fried and oily foods. * Prefer fruits and green vegetables. * When you apply any cream, sun screen and the like, clean your face at the earliest, so that there will be no adverse action of the chemicals on the delicate skin of face. Your skin ?breathes? through its pores which are not to be closed for long. There is good treatment in Homoeopathy without causing adverse effects. The medicines work internally, tackle the root of the problem. If you are interested, please furnish the following information. *. Since how long you have this problem? *. Describe symptoms *. Any other health problem, like- tension, acidity, indigestion, etc (female patient may have pimples linked to menstrual irregularities) . Hello sir I am moni .l am 32 years old woman my underarms is dark please solve my problem. Please Apply milk and turmeric regularly Twice a day for 3 weeks Avoid using razors Apply skin light cream by Himalaya regularly. I am eighteen years old. I have little white spots on my skin from one week, specially on my face. Is it curable with easy steps? How can I remove this white spots from my face? Hi, try to avoid sweets. Start to expose to early morning sunlight. Use to apply basel leaves juice with salt on white spots. I hav a surgery scar on my face. What should I do to reduce it appearance and redness Suggest me a cream. Hello, Apply Homoeopathic medicine – Thiosinaminum Q few drops mixed in a glycerin solution on scars that are visible (as it is less greasy, so is more easily absorbed into the skin). Also take Causticum 200 orally twice daily for 4 weeks. I am student. From last 2 years I loss my face glow. So give some some suggest to get skin glow. And give some names of food to be taken for that. My face is full of dark spots due to a skin deasis from which I suffered in my childhood the spots are very dark and all over the face I tried many home remedies and creams also but there is no improvement the spots are not removing right I can't went to a doctor so I want a suggestion so that at least the spots become lighter because it is ruining my whole look. Apply Demelan cream for application once in a week at night (very little only) over scars and marks only. Avoid extreme sun exposure during day time. For faster improvement of marks combination peels can be done at skin clinic treatment done by dermatologist. My skin is so sensitive and I have skin infection problems everytime how can I protect my self ? Please take following medicine:- natrum sulph. - 6x/4 tabs thrice a day for one month. Revert back after one month with feedback.